Christopher Peterson is a master of impersonations, both visually and vocally, and his comic timing is impeccable. The show is All Live, no lip-sync, and audiences will be thrilled with his characterizations of Marilyn Monroe, Carol Channing, Madonna, Joan Rivers, Reba McEntire, Bette Midler, Tina Turner, Julie Andrews, Barbra Streisand, Liza Minnelli, Judy Garland, Eartha Kitt, Cher, Bette Davis, Lucille Ball (whom he portrayed next to Cuba Gooding Jr. in the hit movie Rat Race) and now even Lady GaGa. This is a show not to be missed, one the whole family can enjoy (well, The Adams Family), so pick up the phone and book it NOW!!! 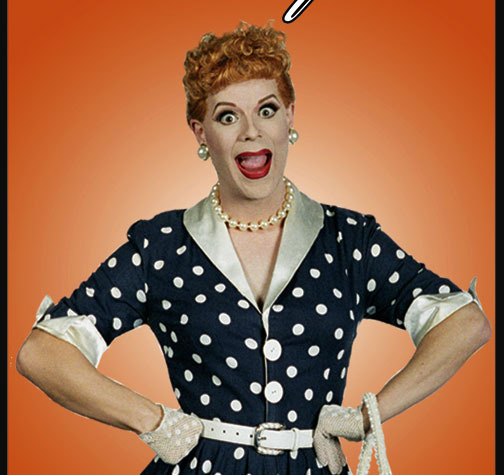 Christopher Peterson is, without doubt, North America’s foremost female impersonator. His stature in the field is said to be equivalent to that of the legendary Jim Bailey—and Peterson still has years in which to expand his reputation. Most recently, he reprised his role as Bette Davis in Bitchslap at the Waterfront Playhouse in Key West. Bitchslap, by Darrin Hagen, is about the feud between Bette Davis and Joan Crawford during the filming of What Ever Happened to Baby Jane? and was brought back to the theatre for a second run by popular demand. Born in Moncton, New Brunswick, he discovered a love for the theatre early in life and began developing his female characters while he worked on his theatrical career. In addition to appearances on BCTV (The Vancouver Show) and Global Television, he was featured on Fashion Television, The Shirley Show and as co-host of The Dini Petty Show with Dini Petty and as Dini Petty. For three years, beginning in 1993, Christopher appeared at The Edmonton Fringe Festival in Guys in Disguise. He played the female lead in Canadian Stage’s production of Tom Stoppard’s Rough Crossing and workshopped the role of Robin Turner in Brad Fraser’s stage musical adaptation of the hit movie Outrageous. His acting abilities were acknowledged when he won the Dora Award (Canada’s equivalent of the Tony) for his remarkable performance in Brad Fraser’s Poor Super Man. Having proved his talents in Canada, Christopher moved to Los Angeles where he worked for a year with An Evening at La Cage. While in LA, he appeared on Truth or Consequences and Taste of LA Revue, as well as making a special appearance on Evening At The Improv. Peterson appeared in the award-winning documentary We’re Funny That Way, which detailed the first gay and lesbian comedy festival in Canada and was later released on Showtime, Cinemax and HBO. He also gained a great deal of attention when he was featured as “a Lucille Ball” in Rat Race, starring Cuba Gooding, Jr.
Christopher developed his one man many women extravaganza, Eyecons, during a two year stint with the Canadian touring show The Impostors, and in 1996 had three successful runs of the show in Toronto: twice at Buddies in Bad Times Theatre, followed by a three-week run at the Tarragon Theatre. Eyecons has played The Citadel Theatre in Edmonton and the National Arts Centre in Ottawa, and in the spring of 1999, toured throughout eastern Canada. In 2000, Eyecons was nominated for Desert Star Award for Best Overall Production of a Musical Revue by the Desert Theatre League, Palm Springs, California. There is no lip-synching involved, and Christopher Peterson miraculously changes from one character to another right on stage with clever help from his backup dancers. His comic timing is impeccable, and his singing is amazing. Eyecons has topnotch production values with superb costumes and lighting. Never static, Peterson is constantly introducing new characters and numbers to Eyecons, keeping it fresh and vibrant. Over the years, inspiring women he has played in Eyecons include Madonna, Lucille Ball, Bette Midler, Patsy Cline, Judy Garland, Marilyn Monroe, Reba McEntire, Tina Turner, Joan Rivers, Shirley MacLaine, Dr. Ruth, Barbra Streisand, Bette Davis, Katharine Hepburn, Carol Channing, Liza Minnelli and Julie Andrews. You never know who will show up on Peterson’s stage when you go to see Eyecons. Christopher Peterson is a master of impersonations, his comic timing is impeccable. The show is all live, no lip-sync, and audiences will be thrilled with his characterizations of Marilyn, Reba, Cher, Liza, Tina and more!